WHY NOT BUILD YOUR OWN BOW? Nearly a half century ago, ElMont L. Bingham, founder of Bingham Projects, Inc. envisioned a way to provide the avid archer with the means to become a do-it-yourself traditional bowyer. To accomplish this, he drafted How to Build Your Own Traditional Bow manuals, full-sized blueprints, and later, videos. He brought together the best component material and developed traditional bow kits. We have everything you need to build your own traditional, personalized bow. Classic style. Responsive. A good balance of performance and forgiveness. Available in 60" or 58" lengths. 2" or 1.75" widths. Width is purely cosmetic. Some people like a slimmer appearance and feel. Also called a three-piece-take-down, the Take-Down Recurve bow offers all the advantages of the classic, aggressive Recurve limbs, but with the added bonus of being able to take the bow apart for travel or storage. Traditional, pleasing lines. You can choose between our classic 68" flat limb design, 68" reflex/deflex, 64" reflex/deflex, and our 62" hybrid reflex/deflex. Reflex/deflex models offer increased performance and smoothness. This three piece take-down longbow has beautiful, classic lines and has great performance, smoothness and forgiveness. In addition to our 68" model, you can make any length from 58" - 68" using the same press. The Pronounced Take-Down Longbow has the same characteristics as our "Shallow" design but with more reflex/deflex. This will give you even a bit more performance. As today’s leader in the industry, we continue to provide the finest quality bow making supplies, instruction materials and dvds, custom bowyer tools, and traditional archery equipment available. 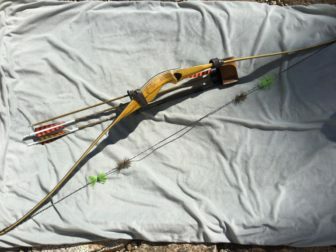 In this manner, the weekend bowyer and the professional bowyer alike are able to experience their dreams of building a beautiful Traditional Recurve, Take-Down Recurve, Longbow, Take-Down Longbow, Reflex/Deflex Longbow, and most recently, the popular Hybrid Longbow. Hi Binghams! 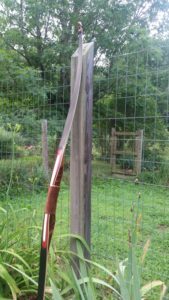 I've been building laminated wood bows for several years, and at the request of a friend earlier this spring I ordered a limb package (50#, 2"wide) and built him a 68" takedown recurve with bamboo and uniweft core, using your plans. It was very successful and we were both very happy with the results. Elmont, attached are a few photo's of Pronounced Longbows I have made. Thanks for being there to assist my efforts in making great shooting bows. Here is my latest bow. 57# burgundy camo with black limbs. Thanks for all your help and fast courteous service. Thanks for great products and support. I finished my first recurve. I love it. I'm starting a second one. I’ve made several bows from your plans, from recurves to hybrid longbows like this one. Each have been a joy to shoot and build.